14 Feb: Okay, this is the moment when I cut off comments on this post. Any comments past number 490 will not go into the random number generator. That sounds so unfriendly but that's the rules, sorry to anyone who makes a last minute visit. Thank you all for visiting, I hope to get around to everyone eventually and I'll announce the winner tomorrow at this time. MEMO 13 Feb: this was meant to be my cutoff date, at 6:00 p.m. Due to an electrical storm the time has passed so I'm now going to extend to Sunday 14 Feb (Valentine's Day!! ), still at 6:00 p.m. Sydney time. I will announce the winner in my blog and by email to the winner on Monday 15 Feb, 6:00 p.m. I'm a Magic Carpet Ticket Holder 2010 - One World One Heart - join me in this adventure! I'm giving away my Magic Carpet journal. With its luxurious paste paper covers, exotic 16 needle Coptic binding with Celtic overtones and 216 pages, it's just waiting to be filled with your thoughts, dreams and desires. And just one of my lucky readers will win this potentially magical book (you have to supply the magic, of course) simply by leaving me a comment on this particular post. What could be an easier way to become the owner of a Magic Carpet to your dreams? Please be sure that your email address is in your comment or a link that I can use to contact you. I'd be dreadfully upset if YOU won, and I couldn't contact you. The winner will be chosen by the completely impersonal "Random Number Generator". Apart from that, this exercise should be a warm and friendly experience allowing bloggers from all over the world to make contact with one another. The hand made paste paper covers of my Magic Carpet journal. While visiting Lisa at A Whimsical Bohemian I learned of her project "One World One Heart", an event for bloggers world wide. Here is an opportunity to meet other bloggers and possibly win one or more of the many give-aways offered. Every contributing blogger lists a prize which will be given to one lucky reader when names are drawn on the cutoff date, which in my case will be at on Saturday 13 February at 6:00 p.m. [This is Australian Eastern Daylight Saving Time which (I think) equates with midnight California time. I'm sure someone will tell me if I'm wrong.] I will announce my prizewinner on my blog and by email at 6:00 p.m. on Monday 15 February. Visit Lisa for a list of other participating blogs and check some out, leave comments and put yourself in the running for other prizes. Just a note about the Magic Carpet book: The paste papers are my own and the covers are wrapped and non-adhesive. The binding is Coptic, sewn with 16 needles, using Irish linen thread, and embellished with a two colour Celtic stitch. The pages are torn edged, the paper is very basic cartridge, which makes it more suitable to writing in rather than water colours or other really wet materials. I'm rather fond of this book but feel that this is an occasion when it really is nice to be able to give away a favourite. Lisa started One World One Heart in 2007, when she had over 85 participants. In 2008 this number was tripled, and in 2009 there were 911 participants representing 28 countries. The chance to win something is a great draw card but in the end, as Lisa puts it "it's about finding kindred spirits." Personally, I'm all for finding kindred spirits and as I've already found a few wonderful people through blogging, I'm sure this is a way to find some more. Remember, a comment on this post gives you a chance to win this book. Visit other participating blogs and leave a comment for a chance to win their giveaway. Good luck and have fun. I hope you meet some great bloggers. Wow! Love the cover. How lucky to be the recipient of such a gorgeous and magical giveaway. I could do with some magic. OMG hat a an amzazing book. Gorgeous work. I love them. Please throw my name in the hat. Thanks. Wow, it's absolutely gorgeous! please add my name to the hat! Really beautiful book. Would love to win. WOW! dont see enough Aussie artists online! Oooh what a great prize and an interesting blog!Count me in please! oh what a lovely book and idea! How can you bear to part with such a wonderful book? Please add my name to the list of hopefuls. Oh, how I squealed when I saw that book! I love a good journal. Someday I will learn bookmaking. But not, I think, tonight. Perhaps someday I can record my learning process in such a lovely journal...? Hi Carol, thanks for having visited my blog and entered in the giveaway. great give away, please count me in! Your journal is very attractive! Thank you for giving me a chance to win it. And thank you for visiting my OWOH blog earlier today! Lovely giveaway that I would love to have and I LOVE handmade journals! Please enter me! PS I'll be out of the country and away from the internet from the 14th-20th. If I am lucky enough to win, hold that prize for me!!! LOL! that is one fabulous journal...the winner will be so thrilled to receive it! Hi Carol, nice to meet you. Love your give-away, please count me in. I do a little bit of bookmaking myself, but nothing as beautiful as yours. BTW, where is Wamberal? Is it too far from the Blue Mountains for us to have a play day??? LOL. I hope you can drop by my blog for a visit too. Have fun and enjoy the ride!!! that is a beautiful book Carol. So glad to see you are enjoying your life and all the activities in it. Hi Carol, what beautiful books you make and I love the pic of new tutu ! What curls ! Thanks for comments on my blog, look forward to reading more, later. Great book! !Please count me in! That book is superb, love the covers and the binding! Please count me in! i am so happy to have found your blog through this one world, one heart event. i love the colors and texture of the pastepapers you used for the book. thank you! This is gorgeous. I know how hard it is to bind a journal. I've only tried once and gave up. Mine didn't look anything like yours. Such a wonderful project and a beautiful book! Wow! Love that binding and your covers. Ooh! Pick me, pick me! Your work is really amazing. I wonder what I've got that I could give away . . . I love your Magic Carpet journal. Great work! That is a really cool journal. Love the paste papers and the binding. Lovely journal! Please enter me in the giveaway! Stunning journal. I would love to be the recipient of such a work of art! Please drop by my drawing, as well! This a gorgeous giveaway, please add my name and feel free to visit my blog too. Please include me in your wonderful giveaway. Thank you for this opportunity to join in on the fun! beautiful journal...love the binding technique. A lovely journal. Thank you for the chance to win. WOW!!!! What a beautiful journal. Please add my name for your giveaway. Love the name of your blog and the banner is fab. What a fabulous give-a-way! I'd love to be included for your journal! I love this book and would enjoy putting a great story in it. What a beautiful book, I love the binding. Glad that i joined this event! Carol, it's absolutely gorgeous! I'd be thrilled to see one of your books in person :D Please include me in the drawing and thanks for stopping by my blog earlier! this is just gorgeous! please enter me! I have having so much fun traveling the magic carpet! How beautiful. I would love to win this journal. Wow that is an awesome giveaway! Please count me in. Wow! This is a beautiful book the winner will be a very happy person. Let it be me! I never met a book or journal that I didn't like or want! Count me in! This is such a beautiful journal! No wonder it's one of your favourites. Thank you for offering it as a prize for this year's OWOH event. I have a soft spot for journals and sketchbooks so please include me in your draw. Thank you! Please enter me in your beautiful giveaway! I'm participating, too, so stop by my blog! Fabulous! Check out my giveaway too! what a beautiful giveaway, please count me in. Why not pop over to my blog and join in my giveaway too. beautiful please add my name. Also visit my blog to see my giveaway. I'd love to enter and you can enter on my blog as well. Having read about but not mastered the coptic stitch yet, I can appreciate the work it took to create this wonderful book. I'm so glad you have decided to share it with us. I am participating as well. Please pop by! I am doing all sorts of things with my magic wand right now, is it working??? Just in case I don't have the right kind of magic, please enter me in the draw for a chance to win. Thank you. What an amazing book! Just stunning! I just love journals, especially hand-made ones. Such a lovely giveaway. I just love One World One Heart, thanks for entering me in your giveaway. Please stop by and enter mine. What a lovely prize. Please enter me! If you have time - pop over to #270 to enter mine. What a fabulous giveaway and how talented you are. I hope you'll have time to stop by my blog also. Gorgeous book! Please enter me! It is beautiful! Please enter me! Visit my blog giveaway as well! Oh, my! What a wonderful journal and I love that it's magical! I'd love to give it a good home and use it! Thanks for the opportunity to win! What a beautiful journal, do enter my name into the hat, Linda:) and visit us at..
Love your talent! 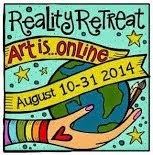 This would be perfect for a bead sketchbook, please add me to your list and join me! All I can say is OH YUM! enter my name and I will keep my fingers crossed! Please stop by my blog and enter my little give away too! The journal is gorgeous! Please count me in! What a gorgeous journal! 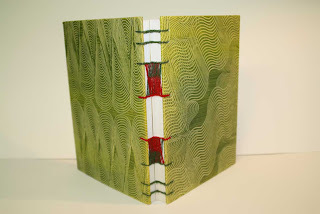 Your blog makes me want to learn how to make books. I'm hoping to win your journal giveaway! Thanks for participating. I am #373 on the OWOH Magic Carpet Ticket Holders list. I would love the opportunity to win this giveaway. That journal is beautiful! I love your binding style. The ability to open the book all the way is perfect for writing or sketching out all the best dreams and secrets. I absolutely love your beautiful hand stitched journal, can you please enter me in the draw to win. I'm stopover #70 on the Magic Carpet Ride. Please come by and visit me too......enjoy the ride....and happy landings. What a gorgeous journal! I love the cover. Come enter my giveaway, too. Absolutely lovely, thanks for hosting! That is a great journal! I am giving away a set of hand-made soaps as well as a custom tutu! Hope to see you there, good luck! Thank you for the chance to win! It's nice to meet you and don’t forget to come visit me too. I’m #391 on OWOH. How fun! I'm hosting a giveaway as well, come stop by! I would love to be included in your giveaway! That is such a beautiful picture at the top of your blog. I love the journal you're giving away, I could sure use a nice journal to add my recent vacation thoughts to. Wow! What a wonderful book! Please enter my name-- thanks so much! Beautiful Journal! Please enter me and be sure to stop over and enter on my blog. That is a lovely book! I hope it comes into my possession so I can figure out how you did a 2 color celtic weave with the colors on one side! Very cool book, I would love to be entered too! Do stop by mine if you have a minute. What a gorgeous journal. I would count myself lucky to be the winner! Have fun surfing! Oh dear, you touched my heart! pretty papers, and a blank journal. I'm swooning :) Truly lovely work! wow, what wonderful craftsmanship. I would be honored to own that journal. Lovely, please include me in your draw & visit me at #60. Oh wow, what a beautiful journal!!! I would love to be entered into your drawing. Beautiful book! Please sign me up to win! I love handmade journals and this one is awesome! Thanks for the chance to win this fab giveaway. What a fabulous cover!! If I win, could you write something in the front cover for me? Like your signiture and when you made it and such? Oooh! I hope I win! Green's my favourite colour you know!! Gorgeous! It does feel the sort of journal that could inspire some magic, doesn't it?! Enjoy the magic carpet ride!! Such an awesome giveaway! Please count me in. Also, please stop by my blog and enter my OWOH giveaway when you get a moment; I'm #56. Oh my goodness, what an amazing giveaway! I love the smell and feel of paper, and have a whole wall of books as I read so much. 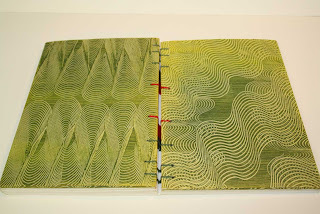 I've never tried bookbinding but from what I've seen it is a very skilled craft. I've fallen in love with your book. Carol, this book is nothing short of delicious. Someone will be very lucky indeed to be able to meet it up close and personal. THank you for the opportunity to win. oh, it is going to take ages for you to read all these comments. I would like to participate into your giveaway. It must be hard for you to part with this gorgeous book. The cover is amazing. Please count me in. Greetings from Maine, USA. What an amazing Journal that you are giving away. I would be honored to win. But thank you even more for saying a few words, not just showing the give away. that makes it more special. By the way, I am at #499. Please stop on over. How fabulous! This is something I would love to win! Please enter my name and visit me to enter, too! I'm #533 on the list! Thank you! What a BEAUTIFUL journal, Carol!! Please enter my name in your drawing :) What a FUN event...enjoy the ride!! What a beautiful book you have created. 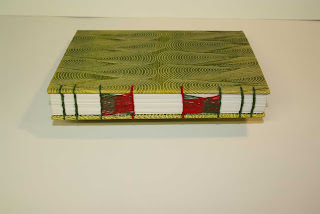 The paste paper cover and the hand sewn spine , simple exquisite. Thank you for the chance to win this. Love your wonderful Carol and thanks for the chance of winning it. I hope you can stop by my blog and see my giveaway too. that's a beautiful journal you've made. I will enjoy writing in it. Please PICK ME to win in your giveaway drawing! thank you. What an awesome journal - love it! I love journals!! Yours is great! Please enter me! oh what a fabulous book - I can just imagine myself opening it up and putting pen to a new fresh page - glorious! I love journals and yours is amazing. That is so beautiful! I love that paper on the cover and the colours of the whole book. Beautiful...I need more journals to jot down my thoughts, dreams and creative art ideas. This one can do nothing but inspire magic! Beautiful giveaway! I enjoyed visiting! I'm having too much fun traveling the world on the Magic Carpet Ride. If you can, pop on over I'm #395 on the list. Thanks for the cchance to win! As someone who is recently disabled a journal is exactly what the doctor ordered! It is STUNNING! I'd be honored to have it! I am new to blogging ( mine is being built) but not new to art and creating. Due to my injuries that has slowed some of my types of creations,but not working with paper,paint etc. Amen for that! Greetings from the New Jersey Shore,USA! nice book, count me in. A beautiful book that you are offering- I love the cover on it and would love to fill it with magical thoughts-if I could. Please add my name to your generous drawing and I hope you are having as much fun as I am hopping from blog to blog, checking out all these creative people. Just lovely! What a great piece. What a lovely giveaway and what a pleasure visiting your blog! I'm #633 on the magic carpet ride...I'd love to have you come and visit! Your book is absolutely lovely Carol! I enlarged the cover shots to really have a look, and I am so impressed! I really hope that I win (LOL)! The colors are mine, as you know, and it would be so wonderful to have one of your coveted creations! wow, this is a beautiful giveaway! thank you for being so generous! Thank you for stopping by my blog and visiting my OWOH event! It was a pleasure to meet you! What a stunning book you have created...so love the spine. I was thinking I recognised the name of this blog...I know I have come to visit on the odd occassion in the past year to see what you have been up to. Keep up the great work...thanks for the chance to win. How lovely so nice of a giveaway.Please count me in! thanks for the giveaway, I'd love to win! Beautiful book. I did some book making years ago so I can appreciate the time and effort you put into making this lovely book. what a beautiful idea. beautiful book too. Your journal is awesome! So awesome I would almost hate to write in it. But I would try! oh wow this is great! I am addicted to journals! Lovely book, Carol. You're kind to offer it as a gift. Love both the paste paper and the stitching. That's a gorgeous journal. I would love a chance to win this. I am such a journal freak! Your offering is just lovely and the paper is really cool. Please enter me in your drawing. I love this contest, it's fun to see all these wonderful blogs that are new to me! Great prize! Your magic carpet journal is absolutely gorgeous. thank you for the opportunity to enter your giveaway. I love the color green :-) And what a beautiful pattern put in the paste there! Oooh, I hope I'll win this book. would be great to hold one of your in my hands and being able to have a closer look! What a beautiful book, and in one of my most favourite colours too! Please enter me in your draw - thank you!